Blueberry muffins made with fresh blueberries! Absolutely yummy – and good for you. 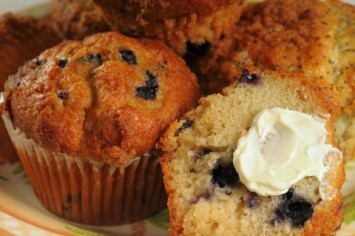 Even kids who are extremely picky eaters will usually eat yummy muffins with delicious blue spots of blueberries. This recipe for blue berry muffins includes just a bit of cornmeal. Cream the butter and sugar together till the mixture is light in color and texture. 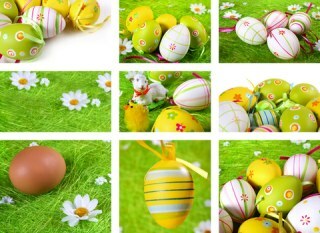 Add eggs one at a time, beating well after each. Beat in vanilla and the lemon juice. Use 1/2 cup of the flour to coat the blueberries. Combine the rest of the flour, baking soda, baking powder and cornmeal. Add dry ingredients to the butter mixture, alternating with milk, beginning and ending with the dry mixture. Add in the blueberries and just mix well enough to incorporate them into the batter fairly evenly. DO NOT OVER MIX THE BATTER. Fill muffin cups 1/2 to 2/3 full with batter. Bake for 25 to 30 minutes or until golden brown. It is always important with muffin recipes not to over mix the batter once you have combined the wet and dry ingredients. You want to make sure everything is incorporated together, but that’s it. Too much mixing will result in a muffin that is not as tender as it could be. Just replace the blueberries with the same amount of chopped cherries for luscious cherry muffins. Buttermilk makes a nice tender muffin. You can replace the milk called for in this recipe with buttermilk if you prefer. Or, use almond milk, coconut milk or soy milk. It will be just as good. You don’t usually see blueberry muffins with nuts in them, but chopped almonds make a nice addition to them and they up the healthy recipe factor too. The cornmeal adds a nice bit of texture and just a little bit of “bite” or crunch to the muffins. You can certainly leave it out and replace it with more flour if you prefer. 1. Replace 1/2 the white flour with whole wheat flour. I always suggest sifting whole wheat flour before you add it to the mixture to make it nice and light, but it works well and tastes great. 2. Use a bit less sugar, or change from regular white sugar to something like coconut sugar. It is a bit less sweet tasting but is far lower on the glycemic index, which means it puts much less pressure on your blood sugar level. Want to really crank up the health factor in blueberry muffins? Look here for our recipe that includes oats and oat bran. Read about all the health benefits of blueberries and other berries.